Introducing Poussez’s label ARTIZAN MUSIC. In addition to Poussez Artizan Music is home to: Andreas Saag, Nacho Marco, Demarkus Lewis, Pete Dafeet, Kris Wadsworth, Terry Farley, Funky Transport, Rich Medina, Rhythm Plate, Blacksoul, MrCenzo, Yam Who?, W10, Eightbitrate, Luke Sawyer, Spieltape, Aqsell Franc, Andy Touchfingers, EZLV, Poetiquette, Rithma, John Larner, Tim Split, Taz and Deporto. Jafar and Maxime Cescau have been djing and producing electronic music since the mid 1990s, following many years at various major record companies, independents, dance music distributors , music studios and pr companies, they both started their first labels around the year 2000. Jafar was running Kwaito Recordings, specializing in more broken beat / soulful stuff whilst Maxime was running 4bit Art and Music. 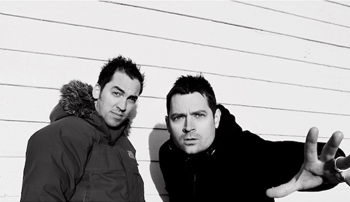 When the pair met in 2003 and began producing together as Poussez, it was a natural progression to consolidate all their energies into one label, thus, along with old friend and Jafar’s label partner from Kwaito, Andy Touchfingers (also a very talented dj, pianist and producer), Artizan Music was born. We would have to go with Plastic People in London. Just a nice sized basement room, properly soundproofed with function one. No frills. All about the music. We’re actually cutting down our DJ bookings at present as we are working on our album. The label has just released EZLV’s ‘Obvious Dilemma EP’ which we plan to follow up with new signings Aqsell Franc (Germany), Estetique (Russia) and two new EPs from yours truly. Remixes in the pipeline by Kris Wadsworth, Sebastian Russell, Phanton and Andy Touchfingers. We’re really proud of the Artizan roster. Kris Wadsworth, Nacho Marco and Andreas Saag have been three great remixers to come on board recently. In 3 years we would like to see some of the following also on board: Spencer Parker, Jimpster, Shurikan and Kerri Chandler. We have the Poussez album forthcoming. As Poussez’s output continues to expand on other labels, we hope this will continue to raise awareness for Artizan Music. We’d like to continue to take our label parties out on the road, having already hosted ‘Uptownboogiedown’ in USA, UK and Sweden. And ultimately continue to survive doing what we love and believe in the most…electronic music. We have to say Poussez. Poussez ‘ Natural Conditions’ (Universal Vibes) This is a little older but still a staple in our live sets. Its what we call aural glue, its one of those tracky records that’s good for layering other stuff over. Well, that’s what we had in mind when we wrote it. We originally wrote the whole EP specifically with Freerange in mind, but our friend Paddy at Universal Vibes loved it so much we gave it to him. We wrote this in our old studio on Kingsland road in Shoreditch. There used to be these weird round windows there and when the traffic went past it used to create this strange valve-y echo in the room. Anyway, we’d been messing around with a modulated effected synth and built the main groove around a series of evolving pad stabs. More chopped up in one section, more extended in another. Jafar got busy on the bassline, nice square bass (if memory serves, think it was Vember Audio’s ‘Surge’, a great VSTi from Sweden) which we layered with a sub. Beats wise we were, as we mentioned, thinking of Freerange for this, so we were trying to get our hats and grooves sounding ‘Milton / Jimpsteresque’ - nice and phat not too minimal. Chuffed with the result. A solid middle of night chugger we humbly feel.